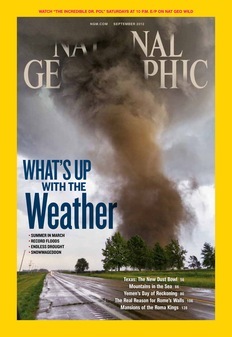 Severe weather events have devastated much of the world in recent months. Flash floods and unrelenting wildfires battered Eurasia as crops in much of North America withered and ice thawed at near-unprecedented rates in Greenland — all within a matter of weeks. This week, Hari caught up with Peter Miller, senior editor at National Geographic, who reported on the subject for the magazine’s September issue. This timeline traces a series of global climate-related disasters that occurred this summer, beginning in June. Monsoon rains swamped the Brahmaputra River in the state of Assam, sending a deluge of water through more than 2,000 villages. More than 80 people died and about a million more fled from their homes. Hundreds of animals in Kaziranga National Park also died in flood-related incidents, including seven highly endangered one-horned rhinos. Officials deemed the floods the worst to hit the region in well over a decade. 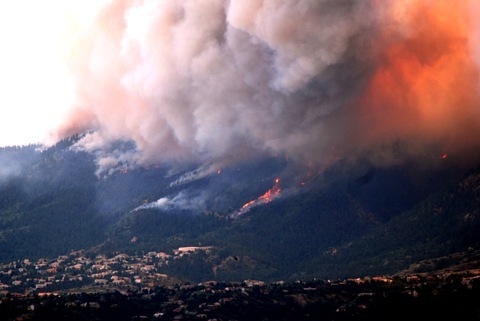 Dry conditions and high winds fueled a string of violent blazes throughout the state, including the Waldo Canyon fire, which killed two people, destroyed 346 homes, and burned hotter and faster than any other wildfire in Colorado’s history. Downpours submerged much of the low-lying and crowded country, triggering landslides and sending surges of water through cities. More than 91 people died, mostly from landslides, wall collapses and lightning strikes, and hundreds of thousands more were marooned on dry land. Though officials were expecting severe wet conditions, many called the rainfall the worst to hit the country in years. Flooding triggered by heavy rains and furthered by chronic deforestation killed more than 160 people and forced 212,000 more to evacuate their homes, according to the country’s state-run media. The downpours devastated crops and came just weeks after high heat and low rainfall drove the Korean peninsula into its harshest drought in over a century. A sudden and fierce thunderstorm reinforced by heavy winds swept through the mid-Atlantic, uprooting thousands of trees and cutting power to at least 1.3 million homes and businesses in Maryland, Northern Virginia and the District of Columbia and killing 13 people. 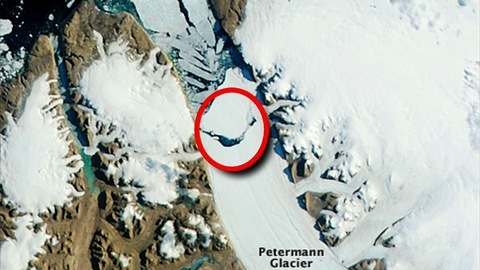 Satellite image of an iceberg twice the size of Manhattan, which split from the Petermann Glacier in northern Greenland. Unusually high heat descended on Greenland, softening vast slabs of surface ice and sparking floods that obstructed scientific research and crippled a key bridge in the western settlement of Kangerlussuaq. Temperatures topped 32 degrees Fahrenheit for four consecutive days starting July 11, and scientists stated the last time such warming trends had appeared on the continent was in 1889. Flash floods swept the southern Krasnodar region in the dark early hours, flushing homes and forcing residents to take refuge on roofs and in trees. “People were running out into the streets in their underwear and wrapping their children in blankets,” one woman told the BBC. Nearly 180 deaths resulted from the onslaught. Dry, hot weather descended on more than half of the continental United States — including Kansas, Nebraska, Missouri, Arkansas, Oklahoma, Iowa and Illinois — parching crops and sparking wildfires. It is the largest drought to hit the nation’s midsection in over fifty years, and experts say its impacts — particularly from waning corn and soybean yields — will translate to drastic food-price increases next year. A series of intense heat waves baked much of Greece, forcing city officials in Athens to close monuments early and provide air-conditioned halls for the public. The blistering conditions sparked huge fires on the country’s eastern Aegean island of Chios; they were some of the worst blazes to hit the country in five years. Unrelenting rain pelted much of southern and western Japan, including the island of Kyushu, where it fell at a rate of nearly four inches per hour. The flash floods swept cars off streets and sparked landslides that demolished several homes. Twenty-seven people died. A torrential downpour battered the capital for hours, submerging roads and killing at least 77 people. It was the worst recorded rainstorm to hit the capital in 61 years, officials said. Fires fanned by high heat and stiff winds spread through the Canary Islands and across regions in western Spain, following the country’s driest winter in 70 years. The fires killed firefighters and scorched parts of Garajonay National Park, a UNESCO world heritage site. Officials said it will take at least three decades for the reserve’s damaged areas to recover. Storms and monsoon rains pummeled the Philippine mainland, sparking floods and landslides in and around Manila that left at least 72 people dead and hundreds of thousands homeless. It was the worst flooding to hit the country since 2009, when back-to-back typhoons submerged much of the capital, killing 140 people. Snow blanketed much of the country, including the capital, Pretoria, which last saw snowfall in 1968, according to records. 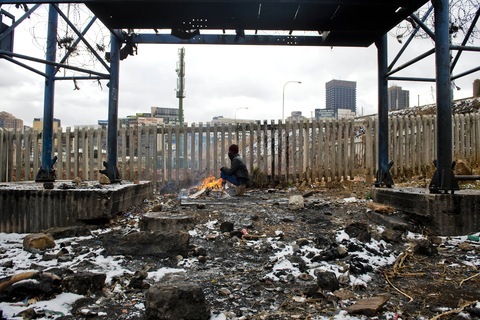 The icy conditions, which are rare even in South Africa’s winter season, covered rooftops and sent bundled masses outside dancing and twirling as flakes fell. Flooding broke out once again in the Krasnodar province as intense rains swamped a nearby river, unleashing a torrent of muddy water through 600 homes in the tiny mountain town of Novomikhailovsky. Four people were reportedly killed and 1,500 more had to evacuate.